(Anzio & Nettuno (Rome), Italy)- This past weekend, the fiercely competitive J/24 Fleet of Rome had a regatta full of fun and lots of racing (eight races in total!) 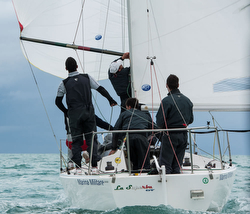 The fleet of twenty-two boats was sailing in their 44th Winter Championship of Anzio-Nettuno, racing for the Lozzi Trophy. Winning the regatta was the famous Italian Navy crew on LA SUPERBA, skippered by Ignazio Bonanno with crew of Vincenzo Vano, Francesco Picaro, Alfredo Branciforte, and Francesco Linares; they dominated the regatta with six 1sts and two 4ths. “On Saturday, a mistral of 22 knots and a flat sea provided the sailors fabulous conditions for racing,” explained Federico Miccio. “The crews did not seem at all intimidated by the strong wind and, indeed, had fun sailing three demanding races on the first day." After eight races and two discards, is was Bonanno’s LA SUPERBA crew that eclipsed the fleet with blistering pace and very sharp tactics and boathandling. Taking second place was the young crew on J-GIUDITTA, skippered by Riccardo Aleandri, Antimo Bruno on tactics, Fulvio Marchionni on bow, and Fabio Di Bartolomeo, Vito Esposito, & Fabiana Onori in the middle. Closing out the podium was Paolo Cecamore’s PELLE NERA. Rounding out the top five were Michele Potenza’s ARPION (also top woman helm) in fourth position and Massimo Mariotti’s AVOLTORE in fifth place. For more Italian J/24 class sailing information Add to Flipboard Magazine.